Two American researchers believe that they have found evidence that there is still a giant planet in our own solar system that we have never seen. It has long been known that the small dwarf planet Sedna moved in a strange orbit and it has slowly become clear that it is not alone in its strange movement. At least 10 other small bodies are flying in formation with it. In the latest issue of the journal The Astronomical Journal, two American astronomers presented the first model that can explain the strange movement of the entire Sedna group. They helped discover Sedna ten years ago and also participated in the discovery of most of the other Sedna group members. 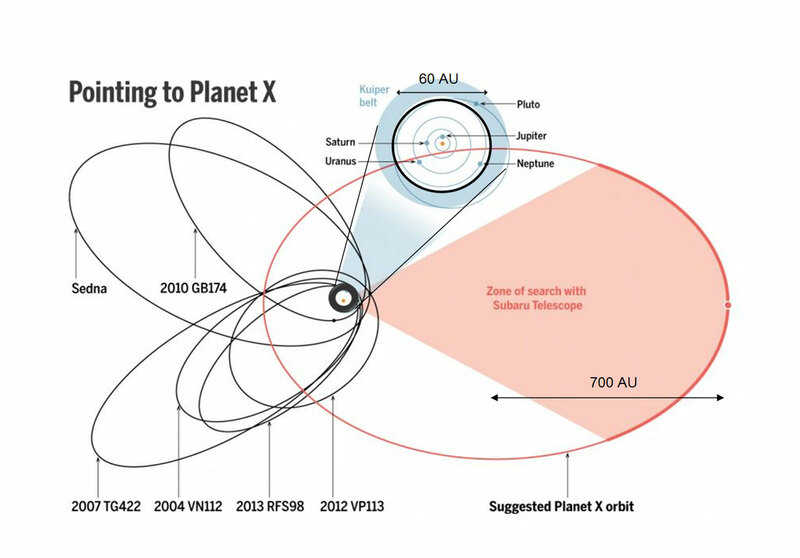 Now they believe that the only possible explanation for the strange movement is that a new giant planet, far beyond where we previously thought the borders of our planetary system, is the cause. The drawing shows our solar system in the centre, (seen magnified and outlined in blue). Planet 9 (red circle) and the orbits of the Sedna group (black elliptical orbits) are approximately 1,000 times great than the Earth’s orbit around the Sun. It was the same way they discovered the solar system’s eighth planet, Neptune, in 1846, from irregularities in the movement pattern of Uranus. And now it appears that the solar system unexpectedly has a ninth planet in an orbit that is approximately 25 times greater than Neptune’s. 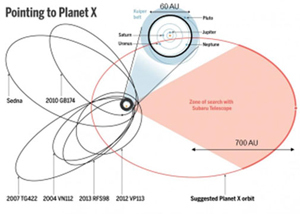 For now it is just being called Planet 9. “In order to be able to push the Sedna group as it does, Planet 9 must have at 10 times the Earth’s mass. If it is made up of iron and stone like our own planet, then it must be about twice as large in diameter as Earth. If it consists of an ice core surrounded by hydrogen and helium, it would have to be around 4 times as large as the Earth in order to weigh 10 times as much. Researchers around the world are now looking intensely for a giant planet that is 2 to 4 times the Earth’s diameter, which they believe is very far beyond what we previously thought was the limit of our own solar system,” explains Uffe Gråe Jørgensen, an astronomer in Astrophysics and Planetary Science at the Niels Bohr Institute, University of Copenhagen. Uffe Gråe Jørgensen explains that, curiously enough, it is one of the most common type of planets found around other stars, planets with a mass right between Neptune’s 17 Earth masses and the Earth itself, or with a diameter of between 2 and 4 times the Earth’s diameter. It has long been an open question, whether our solar system is special in missing such a mini-Neptune or a super-Earth, which they often call planets of this size. Now it appears that our solar system, to everyone’s great surprise, actually has a super-Earth, but one in an unexpected extremely large orbit. How it came to be out there will probably be an open question for many years to come. “Either Jupiter and Saturn hurled it out there several billion years ago or it entered into our solar system from another solar system that lost it. In the time just after the formation of the solar system, the stars in the vicinity of the Sun were still very close so it is likely that they exchanged planets with each other,” explains Uffe Gråe Jørgensen.